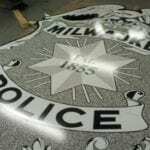 The intricate detailing on a Milwaukee Police officer’s badge is a work of art. When that badge becomes an 11 foot, custom-built sign, it’s truly amazing! 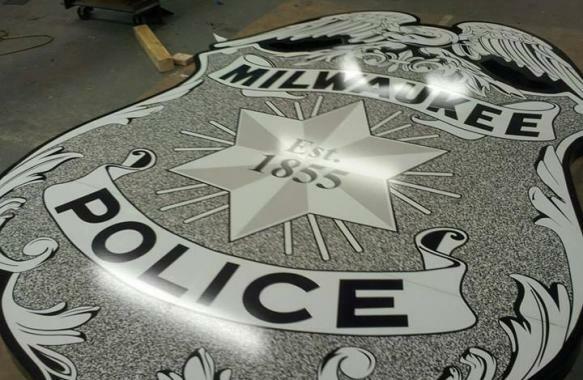 It was an honor to be asked to build this highly visible symbol for the Milwaukee Police Department and install the exterior building signage in their downtown administration building. Our two man installation crew mounted this exterior building signage roughly 8 stories above the ground for maximum visibility using a 150’ lift. 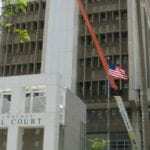 While they ran into a few routine technical difficulties, the install went smoothly. 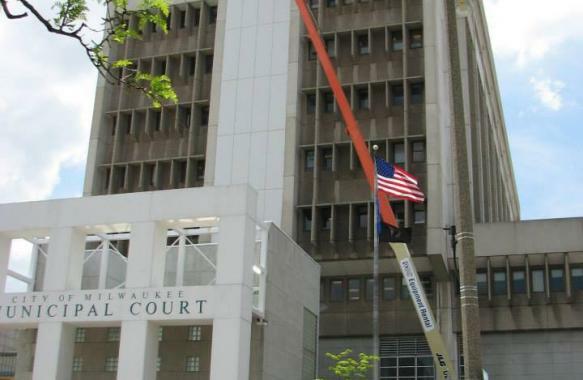 The sign was designed by Eppstein Uhen Architects located in Milwaukee, WI. This unique looking sign consists of a combination of lettering and a detailed replication of the actual police badge used by officers in Milwaukee. The aluminum custom-fabricated letters are 3.5’ high while the badge is 11.5’ H x 8’ W. It is an aluminum panel with digital print overlay fabricated in our shop.